I love espadrilles! I find them comfortable, fun and easy to wear. My favorite ones right now are from Tribeca, and in fact, I own this olive pair on the left. While browsing the web for new espadrilles ideas, I found this pair from Guess that looks very interesting. It's "pretty and happy looking", but then again I'm not sure this is a "real" pair of espadrilles. The rope sole (the defining trademark of espadrilles) is there, but the top is a bit too elaborated and lined, plus the height of the heel is what, six inches?!? Espadrilles are supposed to be comfy and easy to wear, and to me this pair just doesn't cut it. For some reason, my mind wandered to my first pair of espadrilles, back in Italy, when I was about 12 years old or so. This is what us young girls used to wear in my town, and if you look it up, traditional espadrilles have a canvas upper with the toe and vamp cut in one piece, and seamed to the rope sole at the sides. Now, there is a big difference between traditional espadrilles and the modern ones. 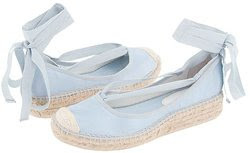 I am not one to scorn modernity or progress, but I would like a pair of espadrilles to always look like a pair of espadrilles, and not like a pair of open-toe sandals trying to be a pair of platform shoes with espadrilles soles. 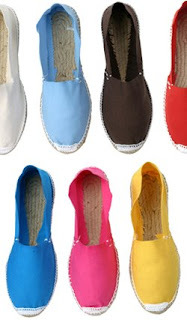 The traditional espadrilles came in many different colors, and didn't cost much because they never lasted more than a season (the rope would fall apart). They are still made today, but customer demand has changed to include more elaborate pairs, like the floral trampolines I was writing about some few paragraphs above. These high-high heels really clash with the whole concept of espadrilles, so today I want to celebrate the (modern) flat espadrilles! "Pretty and happy looking", with a traditional feel. For a great selection of espadrilles (traditional and more modern), visit Espadrillesetc.com. Oh I love those Tribeca espadrilles! Where can I get them? Fabulous collection of beautiful and cool summer shoes. 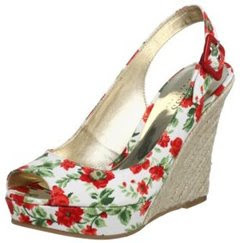 I like those floral stuff shoes most.